The Bhimbetka rock shelters compose an archaeological site and World Heritage Site located in the Indian state of Madhya Pradesh. The name Bhimbetka comes from the mythological association of the place with Bhima, one of the Pandavas (The five sons of king Pandu and the queens Kunti and Madri) in the Hindu epic Mahabharata. The Bhimbetka shelters exhibit the earliest traces of human life in India; a number of analyses suggest that at least some of these shelters were inhabited by human beings for in excess of 100,000 years. Some of the Stone Age rock paintings found among the Bhimbetka rock shelters are approximately 30,000 years old. The artists recorded scenes from the everyday lives of the people who lived in the rock shelters; for example, hunting, cooking, eating, and drinking. They left paintings of religious symbols and rites. A remarkable feature, one that has caught the attention of archaeologists, is that the paintings represent the whole spectrum of time: Period 1 (Upper Paleolithic), Period II (Mesolithic), Period III (Chalcolithic), Period IV & V (Early historic), and Period VI & VIl (Medieval). That provides the archaeologists and art historian a view of the progression of the people who lived in these rock shelters. The Rock Shelters of Bhimbetka (or Bhim Baithaka) lie 45 km south of Bhopal at the southern edge of the Vindhyachal hills. South of those rock shelters, successive ranges of the Satpura hills rise. Thick vegetation covers the entire area. Abundant natural resources include perennial water supply, natural shelters, rich forest flora and fauna, bearing a significant resemblance to similar rock art sites such as Kakadu National Park in Australia, the cave paintings of the Bushmen in Kalahari Desert, and the Upper Paleolithic Lascaux cave paintings in France. As reported in the UNESCO citation declaring the Rock Shelters of Bhimbetka a World Heritage Site, Indian archaeological records in 1888 first mentioned Bhimbetka as a Buddhist site, based on information gathered from local adivasis. Later, as V. S. Wakankar travelled to Bhopal by train he saw some rock formations similar to those he had seen in Spain and France. He visited the area along with a team of archaeologists and discovered several prehistoric rock shelters in 1957. Since then, more than 700 such shelters have been identified, of which 243 belong to the Bhimbetka group and 178 to the Lakha Juar group. Archaeological studies revealed a continuous sequence of Stone Age cultures (from the late Acheulian to the late Mesolithic), as well as the world’s oldest stone walls and floors. Archaeologists estimate that the earliest paintings on the cave walls date to the Mesolithic period. The Bhimbetka shelters exhibit the earliest traces of human life in India; a number of analyses suggest that at least some of these shelters were inhabited by man for in excess of 100,000 years. Some of the Stone Age rock paintings found among the Bhimbetka rock shelters are approximately 30,000 years old. The caves have evolved over time into excellent rock-shelters, ideal sites for aboriginal settlements. The smooth shape of the rocks has led some scientists to believe that the area once lay under water. The rocks have taken on spectacular shapes in several stunning hues and textures. Apart from the central place the aboriginal drawings have in human history, the caves themselves offer interesting material for a study of the earth's history. 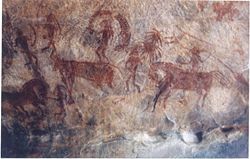 The rock shelters and caves of Bhimbetka have a number of interesting paintings which depict the lives and times of the people who lived in the caves, including scenes of childbirth, communal dancing and drinking, and religious rites and burials, as well as the natural environment around them. Executed mainly in red and white with the occasional use of green and yellow with themes taken from the everyday events of aeons ago, the scenes usually depict hunting, dancing, music, horse and elephant riders, animal fighting, honey collection, decoration of bodies, disguises, masking and household scenes. Animals such as bisons, tigers, lions, wild boar, elephants, antelopes, dogs, lizards, and crocodiles have been abundantly depicted. In some caves, popular religious and ritual symbols also appear often. The superimposition of paintings shows that the same canvas was used by different people at different times. The drawing and paintings can be classified under seven different periods. Linear representations of huge figures of animals such as bison, tigers, and rhinoceroses in green and dark red. Comparatively small in size, the stylized figures in that group show linear decorations on the body. In addition to animals, human figures and hunting scenes appear, giving a clear picture of the weapons they used: barbed spears, pointed sticks, bows and arrows. The depiction of communal dances, birds, musical instruments, mother and child pregnant women, men carrying dead animal drinking and burials appear in rhythmic movement. Similar to the paintings of the Chalcolithic, these drawings reveal that during the period the cave dwellers of this area had been in contact with the agricultural communities of the Malwa plains and exchanged goods with them. The figures of this group have a schematic and decorative style, painted mainly in red, white, and yellow. The association of riders, depiction of religious symbols, Tunic-like dresses and the existence of scripts of different periods appear. Figures of yakshas, tree gods and magical sky chariots represent religious beliefs. The paintings have geometric linear and more schematic shapes, showing degenerations and crudeness in their artistic style. The cave dwellers prepared the colors they used by combining manganese haematite soft red stone and wooden coal. Sometimes, they used the fat of animals and extracts of leaves in the mixtures. The colors have remained intact for many centuries due to the chemical reaction resulting from the oxide present on the surface of the rocks. One rock, popularly referred to as “Zoo Rock,” depicts elephants, sambar, bison, and deer. Paintings on another rock show a peacock, a snake, a deer, and the sun. On another rock, two elephants with tusks have been painted. Hunting scenes with hunters carrying bows, arrows, swords, and shields also find their place in the community of those pre-historic paintings. In one of the caves, a bison pursues a hunter while his two companions appear to stand helplessly nearby; in another, some horsemen appear, along with archers. Scientists marvel that the paintings have remained unfaded after thousands of years. Some archaeologists have postulated that cave dwellers made these paints from colored earth, vegetable dyes, roots and animal fat, although that speculation has been criticized as unfounded. The cave people made brushes from pieces of fibrous plants. Because of the natural red and white pigments the artists used, the colors have been remarkably well preserved. The painters used vegetable-based paint, which has endured over the ages because the drawings had been painted inside a niche or on inner walls. The presence of the figure of a horse, which some suppose to have come into India in relatively recent times, indicates that some of the drawings date back a few thousand years. ↑ World Heritage Site, Rock Shelters of Bhimbetka Retrieved October 4, 2011. ↑ Ali Javid and Tabassum Javeed, World Heritage Monuments and Related Edifices in India (Algora Publishing, 2008, ISBN 978-0875865980), 19. ↑ James Harrod, Bhimbetka, Auditorium Cave, Madhya Pradesh: Acheulian Petroglyph Site, c. 200,000 - 500,000 BP, The Center for Research on the Origins of Art and Religion. Retrieved October 4, 2011. ↑ Klaus K. Klostermaier, A Survey of Hinduism (Albany, NY: SUNY Press, 1989, ISBN 0887068073). Kamat, L.L. "Prehistoric Rock Paintings of Bhimbetaka" Cave Paintings of India, 2011. Retrieved October 4, 2011. All Links retrieved December 16, 2016. History of "Bhimbetka rock shelters"
This page was last modified on 16 December 2016, at 16:34.